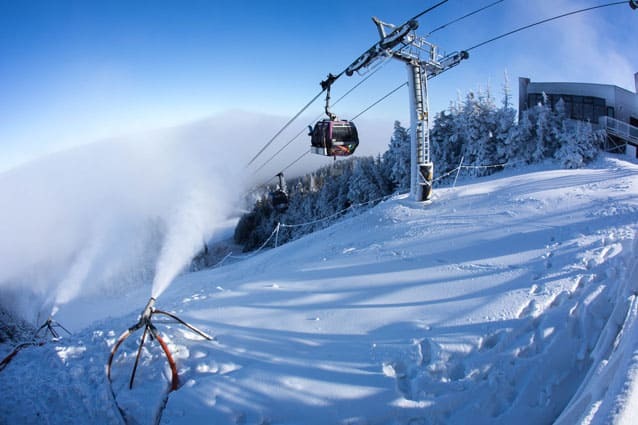 Snow guns blast fresh coverage on Downdraft, just below Killington Peak. The run was steep and the snow fresh. Unloading from the Superstar chairlift, my guide, at that time a Killington Ski School supervisor and PSIA examiner, suggested an ideal warm-up. We cut right through a few trees, and I followed trustingly. The run? Ovation. Within a minute I realized it was dust on crust: I lost my edge and tumbled—and tumbled—finally sliding to a stop at the base. Sometimes a warm-up does anything but create a feeling of warmth. I should have known better. When I was a young man living in the mountains and skiing daily and often on hard descents, my skills were stronger. Challenging conditions seemed more modest then. As we all know, weather shifts and changes in temperature can create a combination of different challenges. Sometimes a dusting on top of smooth ice or frozen crud can create a real challenge. Warm-up runs, ideally, help balance the risks of steep terrain and difficult snow conditions against the reality of possibly skiing more modest terrain. After all, challenging snow can make an intermediate trail more difficult and great snow can make more difficult terrain, well, less difficult. Those who ski less often, though, hate to waste time on a warm-up. Where should we start the day? What should we ski first? Scan the base lodge early. At any base lodge, at any mountain, from Killington to Crested Butte, early morning brings a range of skiers into the lodge, ranging from high-powered experts and racers to casual recreational skiers. The truth is that just as any athlete in any sport benefits from a warm-up, so too, skiers can benefit from a warm-up run. It’s tempting on a powder day to skip a warm-up, but then we risk a crash and burn. Remember: it’s supposed to be a warm-up. The adventures can follow. Warm-up runs can help, well, mitigate risk. That pro I skied with should have known better. I should have known better! Then again, after I crashed he laughed, commenting that he was clearly a stronger and more powerful skier. He was! And as I brushed off the snow, and gathered my skis, poles, and pride, I felt lucky I’d simply tumbled. I’d just hurt my pride. So, where do you start your day? What kind of warm-up is best for you? Your friends? Your family? When we start a season with poor and little snow, and when it finally snows, it’s tempting to immediately cash in unused powder days lest we miss precious runs. It’s really tempting to rush out and seek the steepest and deepest. My friend Bill Jones, the former publisher of SnowEast Magazine, retired a year ago following a health scare, closing the magazine and purchasing a season pass to accompany his new condo in Montana. Recognizing the fragility of life, this long-time skier and avid motorcyclist knew it was time to ski hard and live well. He also knows, I think, that at the end of the day we each remember great runs with great friends. Still, I wonder if he’ll take a warm-up on a big powder day. I’m guessing not. Here’s reality: Killington’s a big playground. You know that, though. Some runs are really long. Some are really steep. Most Killington skiers know that conditions can vary dramatically from one peak to the next. There are trees, parks, slots, and a range of steeps. One friend may find it fine to take a warm-up on Superstar. Another may prefer Bunny Buster. Because our skills and muscles vary, our warm-ups vary. That day I crashed and burned because I needed a less challenging warm-up than my ski partner required. When I lived in the West my hike from the summit to a bowl helped warm all my muscles. Today, on a cold chairlift ride, my muscles tend to stiffen. I need a few turns before I charge ahead. The warm-up is supposed to be a prelude to a day’s adventure. It need not necessarily be on novice terrain. A hike can be sufficient. In the end, it’s your call. Enjoy, from your first run, to your last run.